This is not intended to be a wide ranging article on the use of tablet-type technology in the aircraft cockpit. 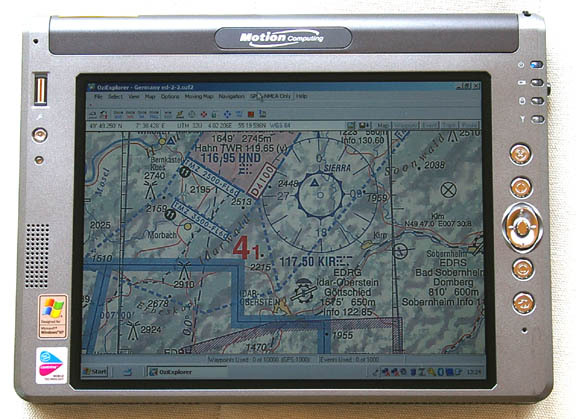 Rather, it describes the use of a specific model of tablet computer, and covers a little of the Jeppesen Jeppview/Flitedeck software. This article was originally written in 2005. Update May 2007: Near the end, there are instructions on how to change the hard drive for a FLASH based one which works properly at altitude. Update June 2007: Near the end, instructions on how to add a small cooling fan, to prevent the unit overheating. Over the past couple of years I have spent rather too much time exploring different solutions for automating the common IFR tasks. I have concluded that the whole aviation flight planning and navigation task is best split into two very separate functions: things to do on the ground, and things to do in the air, and that these two functions require different equipment. While it is certainly possible to address both with one product (most likely, a top-end tablet computer with a range of variously unwieldy accessories and loaded up with too much software for reliability) the lack of an integral keyboard, mouse etc will compromise ground usage and the size, weight and software issues will compromise airborne usage. In terms of weight saving technology, the laptop scene is moving much faster than the tablet scene and there is no problem in finding a lightweight laptop for ground based flight planning. I use a Thinkpad X60S, and use the Canon IP90 inkjet printer to print off the route details, en route chart sections, and the approach plates for the planned destination and the alternate. A laptop can also be used for all the other stuff e.g. email. Some notes on mobile comms are here. This means that while the comfort level is high, with excellent ergonomics and well laid out IFR avionics, there is nowhere (apart from one's knees) to put anything down. There is also not even a square inch of spare surface to which one could fix a mounting bracket for some device located in the pilot's primary field of view. Why bother doing this at all? 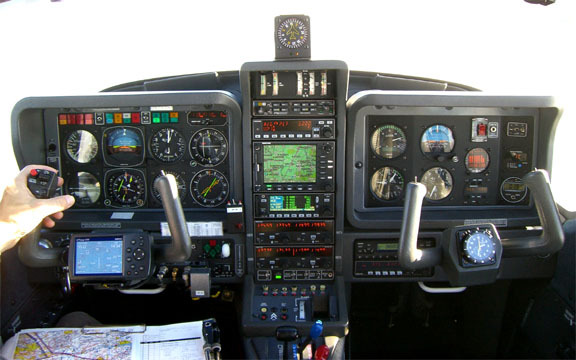 It's often said that a dedicated aviation GPS is the best thing to have, for ruggedness and dedicated controls. Any decent moving-map GPS will fulfil the first requirement, particularly if the flight planned route can be loaded into it from a laptop. My favourite for this would be the new Avmap EKP IV; it has a brilliant large screen and is supported (for route download) by both Navbox and Jeppesen Flitestar flight planning software, but is compromised by poor battery life. 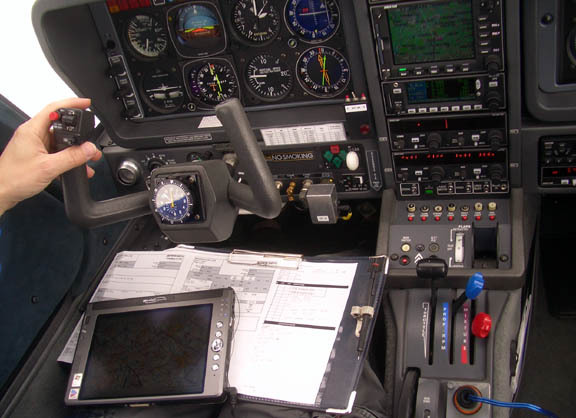 However, if one loses one's main IFR GPS while enroute, it's worth having a backup GPS which has a rapidly accessible DCT function which allows the rapid set-up for navigation to an intersection; this is where a table computer may be preferred because it has an on-screen keypad. The second requirement is harder, because few handheld GPS units have conventional (overlay) GPS approaches in their database. 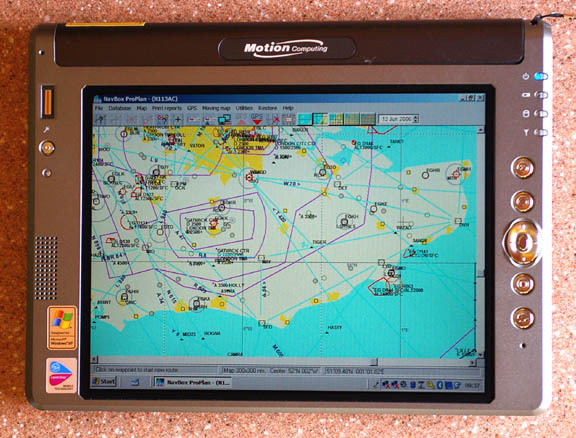 In Europe, the only provider of usable electronic approach plates is Jeppesen and their product, Jeppview/Flitedeck, runs only under Windows or in certain (very pricey) panel mounted multifunction displays; it won't run on any heldheld GPS. 3) Most panel mount GPSs are old technology and a modern product can provide a far better quality display. 4) The panel mounted GPS is the primary reference and it shows where you are going now but a separate unit is handy for exploring alternative routes. 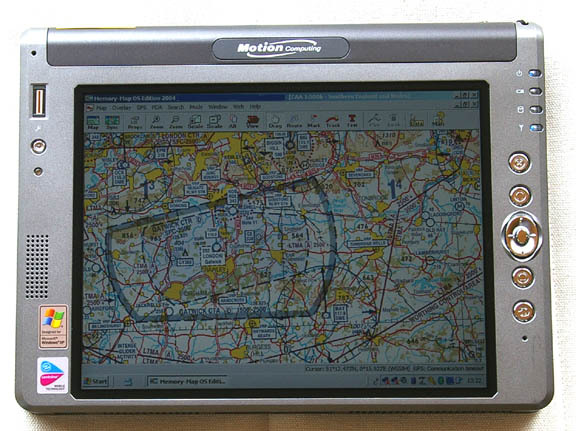 5) A panel mount GPS cannot have a route loaded into it from a laptop; due to certification issues only portable units have this capability. If route planning with a suitable flight planning program, a portable GPS can thus display your progress over the planned route and this eliminates the possibility of a gross navigation error caused by incorrect waypoint entry into the main GPS. 6) A GPS showing a VFR-style terrain map with elevations, can be useful in case of an emergency descent. Also remember that airway MEAs do not guarantee obstacle clearance on off-airway routes.... obviously! This is supposed to be dealt with during planning, but one can never have too much information on terrain clearance. 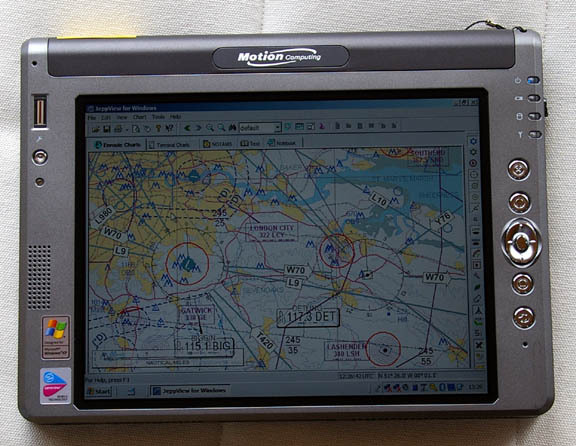 One cannot load different charts into a dedicated aviation GPS, but one can run potentially anything on a general purpose computer. It is also tempting to use the device for ground based flight planning but as I mention above a lightweight laptop is much more suitable for the ground tasks. As mentioned at the beginning, I have spent some time playing with different solutions. The device I spent the most time with was a ruggedised tablet computer from Xplore Technology, the ix104. With the ambitious objective of ending up with one device which can be used for all flight planning and airborne tasks, I purchased one of these, took it apart, and equipped it to run various GPS-related programs, flight planning programs, bluetooth for communications with a remote GPS receiver, and WIFI/GSM/GPRS internet access. With a 1024x768 display and a 10" screen this promised to do the job. After a lot of messing about, it was technologically a "success" but the ix104 is too big, too heavy and, by the time it had the required hardware and software installed, too unreliable to be used in the cockpit. Its power consumption, though effectively supplied from the aircraft through a purpose-built DC power converter, resulted in it getting far too hot during flight in sunshine. Finally, as much en route flight takes place VMC on top, in bright sunlight, it rapidly became obvious that only the very best "sunlight readable" display technology is going to be any good at all for this function. The ix104 is available with the special polarised display which is becoming available on tablets but it is an expensive option, and converting mine was uneconomical. There is a basic restriction which applies to anything running under Windows: the whole Windows user interface is bit-mapped, i.e. it is based on every object being a specific number of pixels in size and this means that one can fit less of the main "form" of an application program onto an 800x600 display than on e.g. a 1024x768 display. This can be a real problem with some modern applications whose basic layout was designed for something bigger than 800x600, and such applications can be all but unusable. Unfortunately, nobody is currently making a 1024x768 tablet in a nice compact 8" display format. A taste of the future is in the recently developed paper-like display technologies e.g. the Irex Iliad. Several products using this technology now exist. They have little processing power, run various versions of Unix, and are optimised for "electronic book" applications - basically just a PDF reader. This product family is suitable right now for Jeppesen approach plate display and other static (not GPS moving map) applications - the big issue is how to automate the printing of a large number of approach plates to PDFs from Jeppview, appropriately sorted into directories etc. Jeppview does not provide any such facility and in the time it takes to do it manually one may as well print them off to paper! I have tested the Irex device and it is good - for this specific purpose. It works with 8GB CF cards (from certain vendors only; 4GB otherwise) and this would hold PDF approach plates for the entire world. The screen redraw is extremely slow - of the order of several seconds - which is just OK for this application, provided the user interface is reasonably efficient. An important factor in the hardware choice is whether you want to use the free approach plates that are available from a number of national "CAA" websites around Europe, and as a collection from Eurocontrol. These were prepared in PDF format, for A4 paper size and, unless the pilot has excellent eyesight, are generally not readable if printed out reduced to the standard approach plate dimensions. They are also not readable (due to text fonts way too small) on an 800x600 display, unless displayed as a part-page which requires scrolling around. A device which can display these free plates as a whole page needs to have an 1024x768 display (or 768x1024 as a portrait) as a minimum and that severely restricts the choice of hardware as the reasonably compact tablets are still 800x600. Unfortunately, it appears, these free plates were designed solely to document the approach procedure within the AIP publication and were never intended to be used for actual flight! Finally, a number of countries (Greece being the most obvious one) do not participate at all and to get their plates you have to purchase a printed AIP (or use Jeppview!). The limitations of the above mentioned free approach plates is a huge wasted opportunity which plays into the hands of Jeppesen and Aerad who re-hash the data into a usable format and charge a lot of money for it. The resulting commercial product, with pan-European coverage, costs around Euro 2000 per year. This is regardless of the media (paper or electronic) although currently only Jeppesen offer an electronic product: Jeppview / Flitedeck. This rather ludicrous price - comparable to the Annual service on a modern IFR aircraft - will put off most pilots. In fact, the software can be installed on up to four machines but legally the subscriber is supposed to own all of them.... There are more limited subscriptions (e.g. the UK only) which are a lot cheaper but the great attraction of IFR flight is the seamless transit of international airspace and having the same software all the way through is highly desirable. Jeppview, in its latest version 3, is a viewable database of approach plates, with comprehensive printing options, with a small subset of the flight planning facilities found in FliteStar IFR. Flitedeck, now included free with Jeppview, is a rather clunky piece of mid-1990s software designed to run on a tablet computer in the cockpit. It accepts input from a GPS receiver and provides a display of the aircraft position over the map data from Jeppview. When correctly set up for the particular flight (which is far from intuitive) the map display will automatically move from the airport diagram (when on the ground) to the en route chart (once GPS derived ground speed exceeds say 40kt) to the approach plate, and the result is a highly impressive piece of situational awareness. Memory Map is a general purpose GPS moving map application, with some rudimentary route planning features, whose aviation data is currently limited to the UK CAA VFR charts (1:250k and 1:500k) only. There is a vast amount of UK and European terrain and road map data available for it (at a price) but for aviation it is good for running the UK CAA charts and little else. Oziexplorer is a generic moving map program which will run with any chart which you can get in a suitable digital format. The problem here is that most mapping data in Europe is tightly copyrighted... this has resulted in a large underground map distribution community and maps for almost everything imaginable are available (usually illegally) on peer to peer file sharing networks such as ED2K. There are very few current-date aviation charts, however. 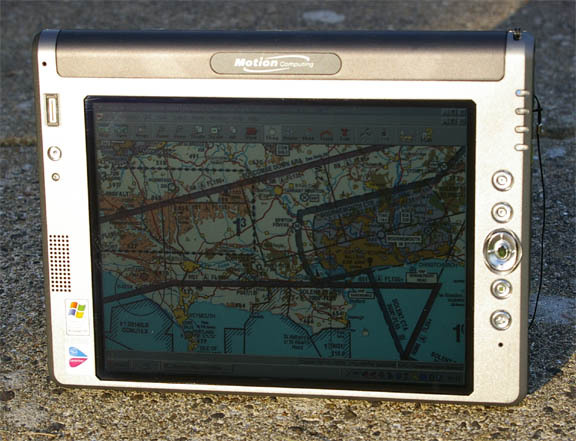 Oziexplorer comes in a Windows and a Pocket/PC version; the Windows version (which is what one runs on a tablet) is required if one wants to calibrate any maps. Navbox (Navbox Pro) is a popular European flight planning program. It caters mainly for VFR flight but the map data includes airways and airways intersections so it can be used for IFR. It also has a GPS input facility which enables a moving map to be obtained over the planned route. The map detail is limited to aeronautical information (though entirely adequate, since the full VFR chart is needed anyway for the full VFR flight planning task) and this keeps the price at a very attractive level. Navbox is a properly updated product, on the 28-day AIRAC cycle, through website download, and due to the number of users its data is at least as accurate as anything else out. Since Jeppesen's recent dropping of their FliteMap product (essentially, FliteStar with GPS input added) Navbox is now the only European flight planning product which is updated on the 28-day cycle and which can run a GPS moving map. PocketFMS is a user-community-updated flight planning application which can provide a GPS moving map over the planned route. I have no experience of it as I use Navbox. With an 8" screen, this promised to be the ideal format. I purchased the version with the View Anywhere polarised screen which is necessary for any degree of sunlight readability, 512MB RAM and a 60GB hard drive. The standard product includes built-in bluetooth and wireless (wifi) networking. Microsoft have laid down a specification for tablet computers which, in short, requires an inductive digitiser screen (not a touch screen like PDAs have) which uses a special pen. This is crucial for cockpit use because operation cannot be accidentally interfered with by touching the screen with a finger or a conventional pen/pencil; in fact one can use a tablet computer as a writing surface if necessary.. Like all tablet computers, the ls800 runs the "tablet edition" of Windows XP which apart from a few features to support the digitiser screen and some other tablet-specific hardware is just like normal Windows XP and runs all the normal Windows applications such as MS Office. The ls800 worked perfectly straight out of the box. No software installation problems were found with Jeppview, Memory Map, Oziexplorer, and a few other applications. Jeppview was installed from a USB-connected DVD drive. For the GPS data source I use a remotely mounted Emtac bluetooth GPS receiver (widely available from GPS shops, and Ebay) which is connected to a rooftop antenna; this was picked up by the bluetooth setup wizard and a COM port was allocated automatically as is normal with serial-data devices connected via bluetooth. Unfortunately the allocated COM port was a very high number, around COM20, and some applications cannot be configured to such high numbers. An examination of the other serial devices (in the Windows Control Panel) indicated that most of the 20 or so "allocated" COM ports numbers were unused so I changed it to COM6. The GPS data stream is standard NMEA and on bluetooth the baud rate actually configured is irrelevant (4800 baud is fine). My application was aviation so I didn't install the usual office software. The ls800 can be easily switched into any of four screen orientations. Many applications will correctly reconfigure themselves while running but some don't do it properly and need to be exited and restarted; the Jeppesen software is among the latter. Other GPS moving map applications I use are Memory Map (shown below) which works really well with the UK CAA digital charts. Unlike on a PDA display, one can see the airspace labels well on the ls800 and the resulting display is a good aid for VFR flight in which avoidance of controlled airspace (both laterally and vertically) is desired. During operation, all the above GPS applications show the aircraft position on the map, typically in the centre of the map. The photos here do not show this since they were taken on the ground. As the GPS emits only one data stream, one cannot run multiple applications from it concurrently. There are some bluetooth GPSs which can support multiple streams but they are rare. However, there is a software application, GPSgate, which converts the single GPS COM port into multiple COM ports, each of which looks like a separate GPS. This enables one to run for example one GPS application displaying IFR route data, and another GPS application displaying a VFR chart showing detailed elevations. These can be on-screen at the same time or, much more likely due to lack of screen space, one can choose which one is on top by clicking on the Windows taskbar. I purchased GPSgate and it worked fine when it worked, enabling four different moving map applications to run concurrently. However, it suffered from reliability issues in connecting to the GPS at machine startup and finally thoroughly corrupted the bluetooth subsystem, necessitating a hard disk restore from image backup. The developer does not give refunds and does not provide support except via a forum where one has to register. These issues are no doubt related to the usual bluetooth stack issues that many computer users have a lot of fun with - once you get something involving bluetooth working, best to not play with it in case it breaks. However, I did not pursue this route due to lack of time and thus cannot recommend this product. Battery life was found to be around 3 hours, with the power management set to never switch off the display. This is reasonable but for any serious use it is necessary to have a power unit which powers the ls800 from the aircraft power; for example from a cigar lighter socket. 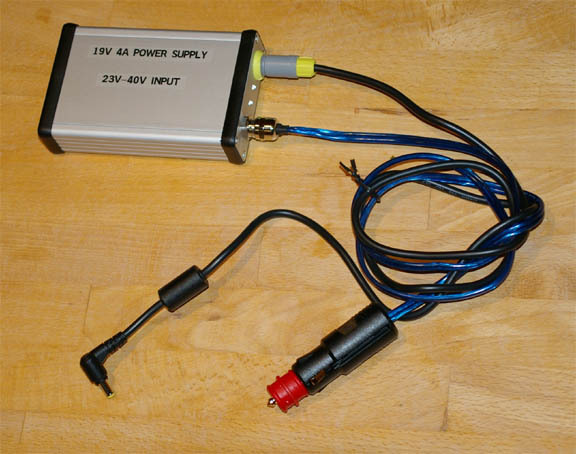 The TB20GT is a 28V aircraft and this rules out most "automotive" adapters (which are only 12/14V and most will go up in smoke with a 28V input); I constructed a compact converter using some industrial components but a suitable converter should be obtainable from specialist laptop accesory outlets. A larger capacity battery is also available which promises to double the endurance but this does not avoid the eventual need for in-flight external power. For night operations, a very low brightness level is essential and most portables fail in this miserably. The ls800 does this acceptably but it will be necessary to use the manual brightness control to get it low enough. In addition, some GPS moving map applications (not Jeppview as far as I can tell) offer a "night vision" mode where the primary display colour changes from white to red. Printing works perfectly as one would expect with a standard Windows XP computer. I use the portable Canon IP90 inkjet printer (USB connected). Serious portable-gadget users will consider the Pentax Pocketjet printer which is an amazing 200/300dpi monochrome thermal printer, with optional bluetooth support and entirely suitable for printing off approach plates and IFR en route chart sections. The ls800 has an SD card slot. Obviously one could use this to load various maps but it opens up possibilities for rapidly loading things like Jeppview routepacks. A "routepack" is a complete route plan and you could prepare it at home and then transfer it to the Jeppview program on the ls800. One can also get an SD GPS receiver but not only are these likely to be flimsy but also there is the old problem which affects all handheld GPS receivers: occassional poor reception in an all-metal cockpit. The ancient pen manufacturer, Cross, is offering a pen called Penabled which can drive the Wacom-patented inductive digitiser screen which all tablets have, and can be used for writing when running a suitable freehand writing application on the tablet. This pen comes in two versions: with and without a cap. The one without a cap is probably better for this application but cannot be purchased from the Cross website; one has to order it from their UK office on +44 (0)1582 422793, cost £40. Contrary to impressions given my the marketing material, this pen doesn't actually work as a normal pen - it is purely a tablet PC pen. The ls800 generates a lot of heat. With a moulded mostly-plastic case which doesn't conduct the heat away well, it isn't a thermally efficient design and runs warm at the best of times. There is no internal fan. Lying down on a surface with poor heat conductivity (e.g. your knees) and in direct sunlight, it gets very hot and eventually a message pops up saying that the display is being dimmed to reduce power dissipation. If the hard disk is running solidly (not the case in a cockpit application) then it cannot lie down flat for very long before overheating and shutting itself down - even indoors and at room temperature. In cases of a hot cockpit, plenty of sunlight, and lack of airflow around the rear surface of it, the display shuts down within tens of minutes, making it look like it has been switched off! I think it could do with a fan. But it really needs a metal case to get the heat out, or a fan. I found the same problem with the Xplore ix104 however, which despite being advertised as a ruggedised military-grade tablet, was perfectly capable of destroying its lithium battery pack if used under direct sunlight and with insufficient ventilation. It appears that the #1 heat factor is screen brightness; at max brightness you need to really watch the cooling situation. Sunlight reaching the unit is also a big problem. The heat problem is compounded by altitude; the thin air makes it even harder to get heat out of it. The ls800 stops working at approximately 14,000ft altitude and is unreliable (in terms of application software crashes) below that level. This is almost certainly due to the HD failing; it is rated to 10,000ft only. This makes it unsuitable for IFR/airways flight unless the internal hard disk is replaced with a FLASH drive. This is pretty amazing considering the number of U.S. aviation software vendors who advertise and sell their products with the ls800 and similar tablet computers - I can't believe that Americans don't fly above 14,000 feet since their Class A airspace doesn't even begin until 18,000 feet. The hard drive is a 1.8" IDE device and flash replacements appear to be very rare at this point in time. I have found one source in the USA and will report when I have installed it. The 16GB/32GB FLASH technology, in the unusual 1.8" IDE format (and with unusual IDE connectors used inside the ls800) is a very new product. This is not a low cost modification; also since Motion will not support this, the moment you open the unit you can forget any warranty. Once I have done it, I will document the installation procedure. 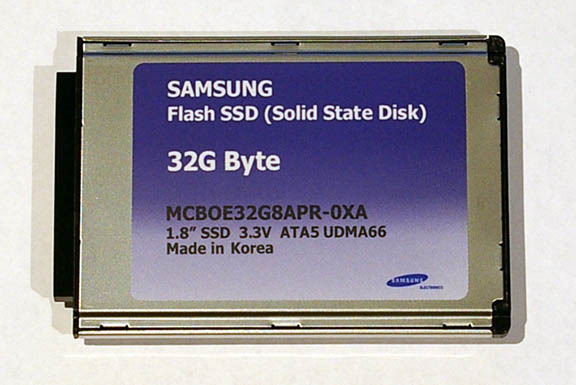 Note 5/2007: Samsung have introduced 32GB flash drives for about US$600 and these are being installed soon... report to follow. Reliability: Anything being used in the cockpit is a relatively critical application and it's best to avoid loading the computer with unnecessary software. Normal applications like Office should do no more than take up space on the hard disk and this will not affect operation, but even there you can get caught out; for example the auto-indexing feature can slow down a computer noticeably. More problems happen with communications software e.g. anything to do with wifi or GSM/GPRS/3G networking; this stuff loads up and sits there looking for the expected adapter and the result is a computer which might run very slowly at times or even freeze completely. The ls800 has a very handy "control panel" utility, by default programmed to pop up with one of the buttons, which makes it very easy to enable/disable wifi and bluetooth networking and one should always leave the bluetooth part enabled (if using a bluetooth GPS), and disable the wifi portion. This also helps with power consumption. I have found it reliable once set up and left alone but it does suffer from the usual Windows issues: occassional crashes, and shutdown difficulties where some application or driver will not allow Windows to shut down so you have to do it pro-actively. The usability of Jeppesen software leaves a great deal to be desired. Do not even think of using it for real until you have become very thoroughly competent with all aspects of it on the ground. This applies particularly to FliteDeck which could hardly be more counter-intuitive and which can be crashed very easily just by pressing certain buttons in the program (the Delete Route one usually does it). On Flitedeck: since this loads up any routepack which it finds in the Common directory, it's advisable to manage your routepacks so that only those required for the current flight (i.e. just one) is in that directory and any others are hidden elsewhere. Another thing is bluetooth - not exactly robust technology, and if you get something working well, don't play with it! Therefore, avoid installing multiple bluetooth connections; for example one for the aircraft GPS receiver, another for an in-car GPS receiver, another for a bluetooth keyboard, another for a printer. It's tempting to play with these gadgets but it's easy to get Windows into a state where it simply isn't reliable. Once Windows gets into such a state it can't usually be fixed and a reformat of the hard drive is necessary. Once the computer is working satisfactorily, do an image backup so you can restore the computer completely to its previous state. I use Trueimage which works perfectly, creating an image of the hard drive on another computer on the network. Those really paranoid should consider Deep Freeze which will guarantee the same power-up configuration every time. The ls800 wifi networking works very well, even with WPA/PSK with SSID broadcast off (a recommended high security configuration for domestic wifi networks) but as described above it is better to leave it disabled unless required, for operating reliability and power consumption reasons. Warning: This article includes references to Jeppesen Flitestar/Flitemap software, which includes a vertical (terrain) profile feature. It has recently (Feb 2007) come to light that the Jepp terrain elevation data is grossly inaccurate and can be several thousand feet out. Furthermore, the error is usually in the unsafe direction. This feature of the software is therefore useless for any flight planning or terrain avoidance purpose. More recently introduced software (Jeppview/Flitedeck) does not have this feature. Flitemap has been withdrawn during 2005 but Flitestar (which does not have a GPS input facility and thus cannot be used as a GPS moving map) remains for sale. Support: There is no support for Windows XP Tablet Edition. As with the Pocket/PC (Windows Mobile) PDA operating system, Microsoft have delegated support to the hardware vendors and if you can't get the vendor to sort out a problem then you are completely on your own. You have to try to find an answer in one of several Tablet PC forums like this or this. Microsoft do support downloadable updates for XP Tablet though; whether you choose to download these for a device used in a critical application (and is not used for open internet access) is another matter. (1) Running CAA VFR charts - under Memory Map. This is for general UK flying around, almost entirely in Class G, and makes it very easy to avoid CAS when flying random tracks (sightseeing, etc). The 800x600 resolution is fine for this. (2) Running Jeppview for approach plate display. This is not a moving map application (that would be Flitedeck - see below). I print out all paper for departure, destination, enroute and alternate anyway, so this is for emergency diversion use only. For this (viewing the approach plate, basically) the 800x600 resolution is OK, not great but clearly the Jepp plates were designed to be readable at this resolution and if you select the whole-screen mode they are completely readable even when the entire plate is displayed. (3) Terrain clearance / best glide heading determination in an all out emergency of an engine failure above a solid overcast above nasty terrain. For this I would use Oziexplorer, running either the Jeppesen VFR 1:500k raster charts (don't ask how they were converted into generic graphics files... ) or generic topo charts (which are available for most of Europe from peer-to-peer networks in 1:25k or 1:50k scale). For this, the 800x600 resolution is fine. Yet another way to do this would be to run the now-discontinued Jeppesen FliteMap which is FliteStar with GPS input, but this does not run well in 800x600 and cannot run third party European charts. All three above can be run concurrently, with rapid application switching, using the GPS-Gate product referred to earlier. The 800x600 resolution is no good for displaying the Eurocontrol plates, which were for the most part stupidly designed to be printed out in A4. It is also marginal for running Jepp Flitedeck as an enroute navigation aid, largely due to the poor design of Flitedeck, with its oversized buttons and the poor algorithm for determining when to display airway intersections etc versus map scale. 800x600 is also poor for running Flitestar, but that's a ground-based planning tool anyway and there are plenty of nice laptops. At 1024x768 none of the above is an issue. I have - for the time being - given up on the original objective of using the ls800 as a backup IFR/airways GPS. This needs absolute familiarity with Jeppesen FliteDeck and how to avoid getting it into some weird mode, or crashing it entirely. My yoke-mounted Garmin 496 is perfectly adequate for flying a series of DCT segments which is all one needs in the case of one's primary GPS failure. The ls800 does the final job described above well. The cost of the unit, around £2000 including 17.5% VAT, is high but not vastly more than a decent aviation GPS, e.g. 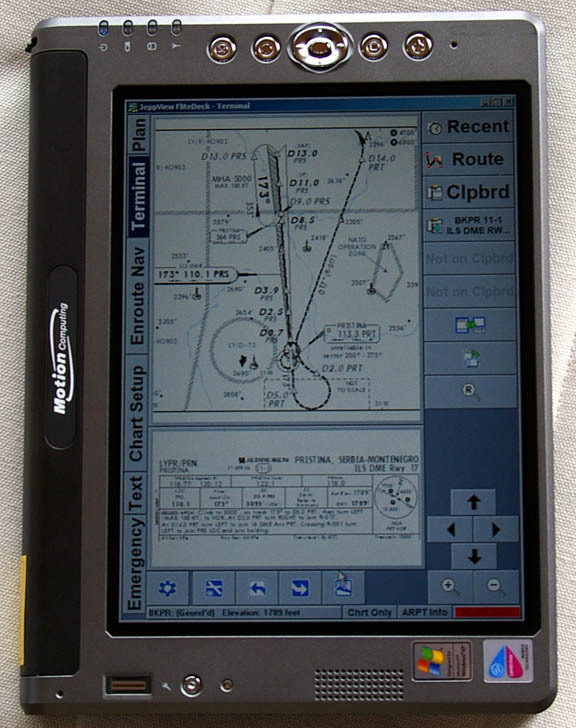 the Garmin 496 or the Avmap EKP IV. The ls800 does make an amazingly good VFR GPS for UK usage, running Memory Map and the UK CAA VFR charts. The ls800 was purchased from Mobitech UK. One can buy it approximately 30% cheaper from the USA but as usual with overseas suppliers you can forget about the warranty. I contacted a number of U.S. vendors and not one of them bothered to even reply to emails. The data sheet for it is here local copy. It appears to emulate a conventional hard drive completely. Since the original ls800 drive is likely to be bigger than the 32GB FLASH drive (my original drive was 60GB), you need to ensure that there is less than 32GB in use! One can purchase a 3.5" to 1.8" IDE adapter and clone the drives in a normal PC, using a program like Norton Ghost. I used the excellent program called TrueImage - this is one of the very rare pieces of software which actually does exactly what it claims to do, and has never failed me. One installs it on the ls800 (like any windoze application), and creates a bootable recovery CD during this initial install process (you need a USB attached CD writer for this), and then one can make a full image copy of the entire hard drive. 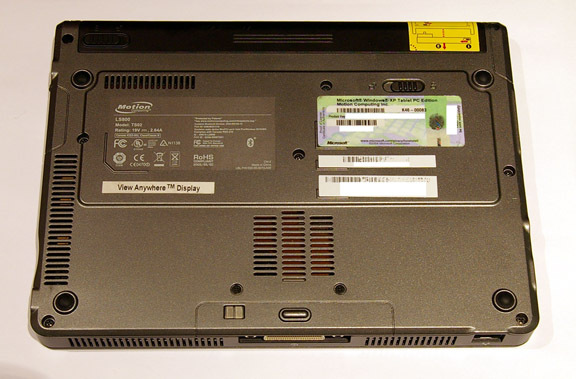 Trueimage contains drivers for most "PC" hardware (including ethernet and the windoze networking layer) and can write the image file directly to any accessible machine on an ethernet network, and the ls800 has an ethernet connector which makes this easy. One could alternatively write the image to a DVD (in a USB attached DVD writer) but even a bare freshly bought ls800 is likely to need a dual-layer DVD and writing those in the generic manner which Trueimage uses is problematic at best; dual-layer DVDs also often turn out to be unreadable in other "dual-layer" drives! With a number of aviation applications installed, my image backup came to about 15GB and I wrote it to a large network-attached hard drive. Another alternative approach: If you received the full operating system setup CDs with your ls800 (I got nothing, despite having purchased it new from an official Motion dealer) then one could use those to initialise the FLASH hard drive after it is installed in the ls800, in which case the above backup process is irrelevant. Note that two of them (the two nearest the large connector at the bottom of the above pic) are slightly longer than the rest, and also have a larger diameter. A tool with a thin end needs to be used, to get into the gap. Here I am using a 3mm flat screwdriver. As soon as you bend the material a little, use a gentle force to pull the two halves of the case apart. All the bending happens in the top part (the LCD) of the ls800 case. I believe the bottom part of the case (shown uppermost in the above pic) is made of magnesium, or some hard plastic, and does not bend. Step 5: Turn over the unit (so the LCD is at the top) and carefully lift away the LCD portion. Two things will prevent a complete separation of the two halves: two wires, and the cord which is attached to the tablet pen. It's tempting to disconnect the connectors and to undo the pen cord but it isn't necessary - for changing the hard drive or for changing the memory modules. Near the top left you see the two wires (white and black) and at the bottom right you see the tablet pen cord still attached. 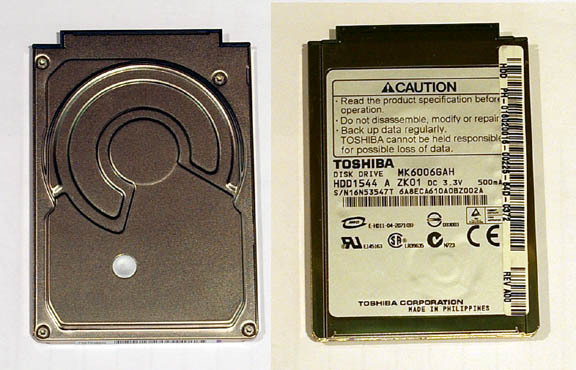 The hard drive is the large component at the bottom left, under the large bronze-coloured flat cable. 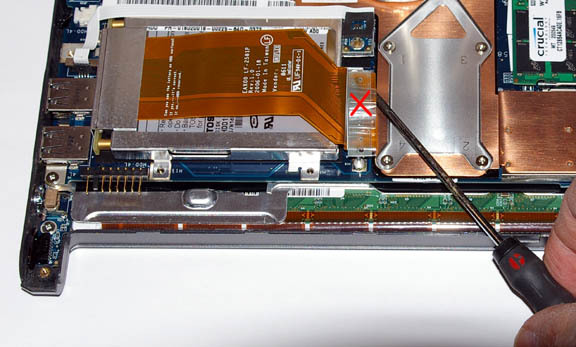 Step 6: Remove the two screws that still hold the hard drive in position, marked with red arrows in the above pic. The drive is actually held by two more screws but they also hold the ls800 case together and you have already removed those. The connector actually has a little clear plastic "handle" on the top of it (where the red cross is above) which is intended to facilitate its disconnection. You grip the clear plastic between two fingers and pull directly upwards. However, the connector is relatively long and has a high insertion force and I decided it is safer to use a small screwdriver to gradually separate the two halves of it, working along the connector and separating it a little bit at a time. These flat cable connectors are flimsy components and it's easy to damage one of the many tiny solder joints. 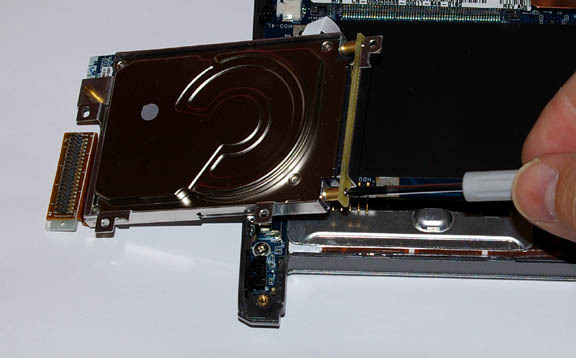 The hard drive is held in place by a thin aluminium housing which is in turn secured to the PCB by several screws, all of which you have by now removed. Removing the two screws in the above pic enables the hard drive to be unplugged and finally removed altogether from the ls800. 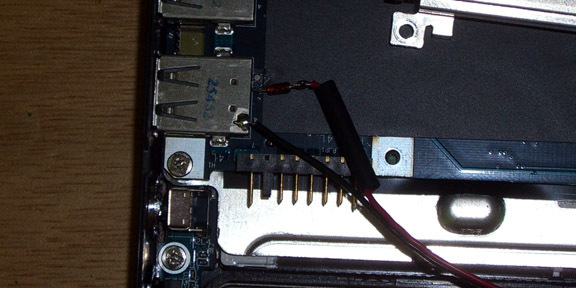 Step 9: Plug the FLASH drive into its main connector; marked with the red arrow below. Be very careful to mate the drive connector without damaging any of the tiny pins. Then reconnect the connector referred to in Step 7, again taking care to line up the pins. 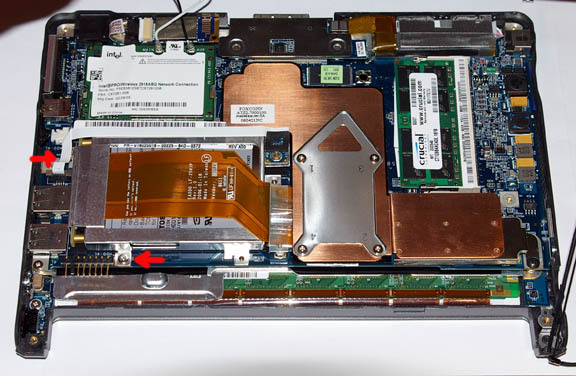 Step 10: Replace the hard drive assembly as it originally was, and replace the two retaining screws referred to in Step 6. Step 11: Put the ls800 case back together, ensuring the antenna wires are not going to get pinched in the process. Replace all screws and the two hexagonal screws on the main connector. Step 12: Restore the original hard drive image to the new FLASH drive. 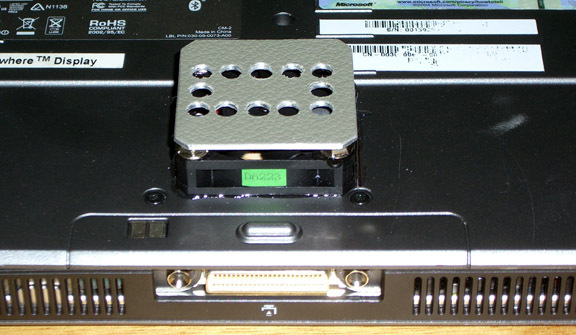 If using Trueimage: With the ls800 unpowered, connect a USB CD drive (containing the bootable recovery CD) to one of the ls800 USB ports. When the ls800 boots up, it finds the hard drive has no operating system on it (what a suprise!) and it then looks for another boot device, and finds the CD. You may have to go into the BIOS to enable CD booting, but I didn't have to do this. Trueimage starts from the CD and loads the basic drivers for the devices, including ethernet. The ls800 inductive pen does not work in this mode but a USB keyboard or mouse provides adequate functionality to select and browse the network device for the image file to restore. When the restore is completed, reboot the ls800. For some reason, at bootup Windows finds a "new device" and asks to reboot again. Preliminary results are very good. The battery life has increased around 1.5 times, depending on the LCD brightness setting (the ls800 LCD backlight accounts for a large chunk of its power consumption). The overall heat dissipation is noticeably lower; however, it is still too high and the lack of a fan is a major design defect of this product, making it unusable in a hot environment and that includes being exposed to direct sunlight at reasonable human-environment ambient temperatures. The unit boots up about 2x faster, and application operation is very much faster, with many operations that used to take a few seconds now happening instantly. It is of course totally silent in operation. It's tempting to fit a miniature fan inside while the unit is open, but there isn't enough room. One would have to hack the case base somewhat. A fan is certainly badly needed. 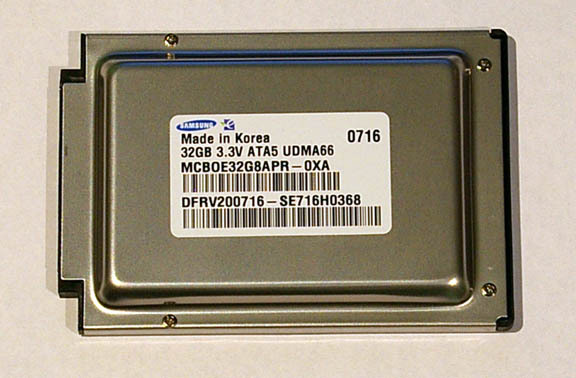 The Samsung FLASH drive was purchased from a U.S. computer parts retailer called NewEgg. They don't sell outside the USA, which meant purchasing it via an intermediary. At the time of writing (May 2007) these drives are very new and rare, but this is likely to change soon. As described above, the ls800 does suffer from excessive heat generation and this makes it very hard to use for anything serious, because you have to constantly watch its temperature. It doesn't actually catch fire but it shuts itself down and will do so without warning and without saving any data. Operation in any kind of sunlight is out of the question at normal ambient temperatures; say +20C, because the received radiant heat will raise its temperature enough to shut it down. Eventually I fitted a small cooling fan. The type I used is Farnell part number 971-4782 ; a miniature 40mm x 40mm ball bearing fan which runs from 5V and draws around 100mA. Tests showed that it starts and runs fine at anything above 4V so a 1N4148 diode was fitted in series to drop the fan voltage to approximately 4.3V and to reduce its current accordingly. It is attached to the back of the ls800 using standard epoxy and is powered by connecting it internally to one of the two USB ports (pin 1 is +5V). For details on how to open up the ls800, see the above instructions on how to install the solid state hard drive. 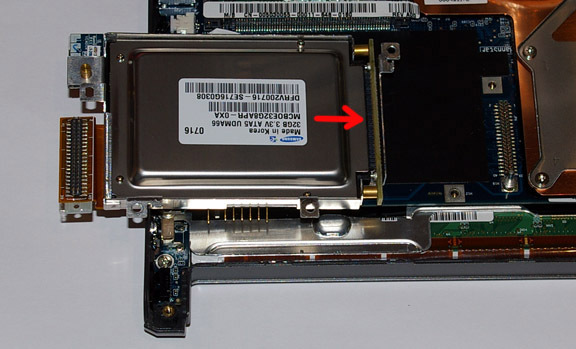 The drive needs to be removed in this case, to get access to the USB port solder joints. The soldering is quite tricky as you have to get the soldering iron a few mm into the back of the USB connector. Note the screws that were glued into the top of the fan, to provide spacing for the metal plate. The resulting gap (about 4mm) ensures that the airflow is almost impossible to block. The fan was mounted such that the airflow is into the ls800, but it probably doesn't matter either way. It doesn't look great but it works! The bottom of the ls800 (the side which the fan is attached to) now remains cool at all times, showing that the heat is being effectively carried away. The display side of the ls800 still runs warm, showing that the display backlight generates a great deal of heat, but the unit now runs happily under all direct sunlight conditions. The battery life does not appear to be significantly affected; the 90mA or so the fan draws is nothing compared to the rest of the unit. The fan is only just audible. Obviously this voids any warranty which you may have had beforehand. This modification highlights the poor ls800 thermal design. It would have been easy for Motion to put in a fan, and a fan much smaller than this one would have been more than enough; even the smallest amount of forced airflow would have been a dramatic improvement over the convection-only airflow which the ls800 uses. If there was a real desire to not have a fan, the base of the unit should have been made of diecast aluminium or magnesium, and the heat generating components should have been mounted directly against this surface; this technique (supplemented by heat pipes) is used in high-end laptops, most of which are cheaper than the ls800. The LS800 has been discontinued, but in its last months was available with a 32GB flash drive, and some of these are bound to come up on Ebay. I still use it and still prefer it over anything I have seen - largely due to its sunlight readability. Nearly all IFR flight is done in sunlight! The tablet market is not really developing technologically, in the way lightweight laptops did several years ago. It seems to be aiming at narrow vertical markets. Quite a number of new tablets have hit the market but none of them have sunlight readable screens. The Korean Viliv S10 is a nice example but this comparison with the LS800 shows how bad it is on daylight/sunlight readability. 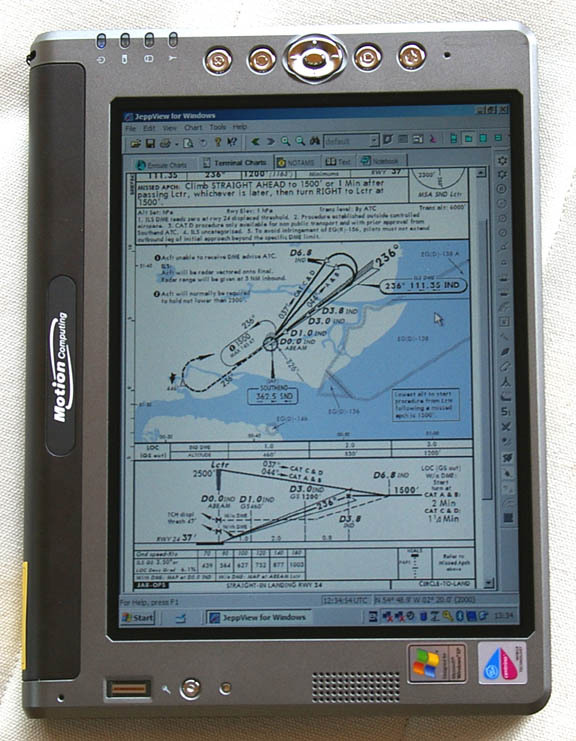 Perhaps the most fashion-notable is the Apple I-Pad but its screen is no better in sunlight than anything else, and it doesn't run windoze so is no good for any current European aviation software; it would make a reasonable "e-book reader" i.e. a PDF viewer which has a much better (faster) interface than the white-screen e-book products. All these products have major advantages over the LS800: lower power dissipation, and solid state drives as standard. I did a test of the Viliv X70EX-3G and while its power dissipation was lower than the LS800's, its smaller size meant is still ran pretty hot. This one is probably the best option at present. It is made to an industrial standard and has a sunlight viewable screen option. Unsuprisingly it is no cheaper than the LS800 was in 2005... around £2000. The vendor was rather reluctant to sell me one, saying it is export controlled (ITAR) and they wanted all kinds of nonsense... ridiculous! 1) A pure PDF reader - for those who can somehow generate or download approach plates into appropriately directory-organised PDFs (but there is no official method for doing this from Jeppview). This requirement can be met by the various e-book readers currently out, except they all have a painfully slow user interface. 2) A full Windows computer - for those who run Jeppview or windoze-based GPS moving map applications such as Oziexplorer or Memory Map. This requirement still needs a full 80x86-processor (Intel or AMD) computer. I am now selling this tablet - £100 plus shipping.